Today I done the GUI for the diagnostics. 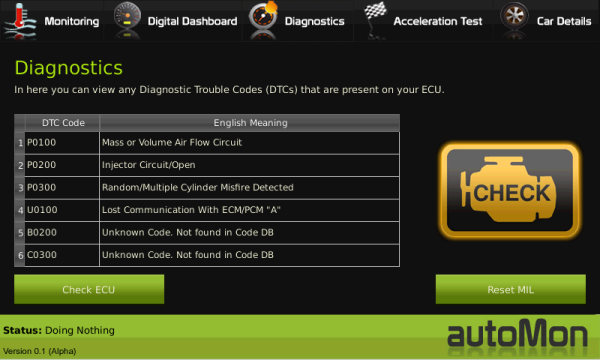 It displays any diagnostic trouble codes (DTCs) that it finds. 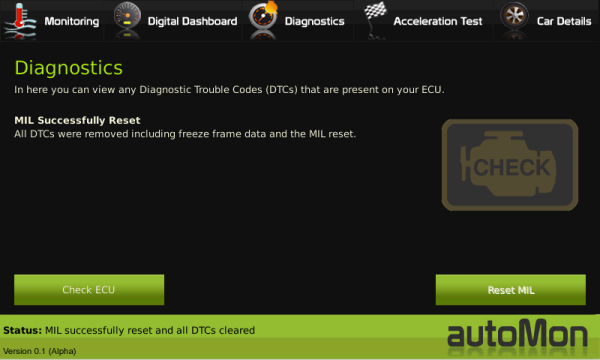 It allows the user to continuously check for DTCs when they wish by clicking the Check ECU button. It also allows the user to clear the malfunction indicator lamp (MIL). This option provides a verification prompt to the user since this also deletes all DTCs and any freeze frame data. One piece of funcionality I would have licked to include was display the freeze frame data but I just didn’t have the time. Implementing it would take another few days. Over the past day or two I’ve being working on the GUI. I changed it from my original ideas below for the moment as I simply need to get this done soon as the deadline is approaching so no fancy animations for now. Each of the panes (tabs) is a custom widget, so basically I’m using a QStackedWidget with 5 custom QWidgets in it. Today I mainly focused on the acceleration test functionality. The look of it may not be what I’m looking for now but as I said, deadlines are approaching and functionality is the most important. 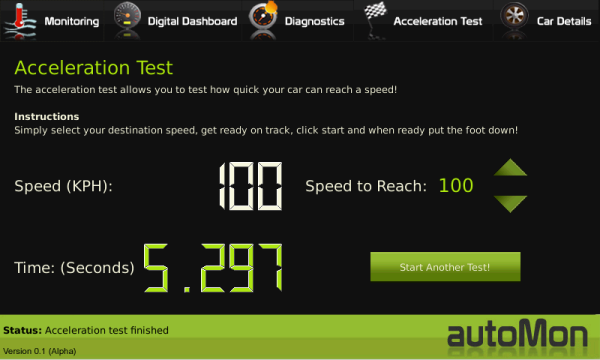 The acceleration test allows one to test how quick their car can reach a specificed speed. This speed is variable to make it more flexible. It can be changed in increments of 5, using the arrows. The maximum value is 255KPH since the OBD II standard can only read up to this. Once the user selects this speed and clicks the start acceleration test button, Automon waits until it detects the car moving > ~1 KPH (Using threshold to avoid accidental starts) and starts a timer. As soon as the vehicle’s speed reaches the specified speed, the timer will stop and flash up the elapsed time. If the car is moving originally when the test is started, it will let the driver know and once they slow down to 0KPH and back up to 1KPH, the timer will start automatically. I would like to add sounds to it, since the TS7390 includes a speaker but there isn’t a sound driver with the system. However it does include a playwav.c file that I can use to play wav files so I might investigate even calling this as a process using QProcess but I’ll have to see how it affects performance. Speaking of performance, the GUI is very responsive, everything responding instantly. The most common codes are the Powertrain codes. A code starting with P0 is SAE defined, while P1, P2, P3 are manufacturer defined, SAE defined, jointly defined respectively. It is a similar naming scheme with the C,B and U codes. My simulator gives 6 DTCs if you press the malfunction button. This also illuminates the MIL. Reading these codes was a little difficult as there are 3 ECU’s in the simulator, ECU, ABS and Transmission unit. So I ended up getting codes from other ECUs as well but knowing where the delimiter was, proved to be difficult. The response to a 03 mode command responds with 43, but 43 can be a valid code as well. The 4 represents a chassis code so 43 00 would be C0300. I could not use 43 as a delimiter so I turned headers on using the ATH1 option and this gave back the sender/receiver/priority and CRC header bits. Using this information I successfully interpreted the correct bytes. Resetting the MIL is very simple, just a matter of sending a mode 04 command. This evening I managed to successfully create a command and parse the result to come up with a nice ASCII string of the vehicle’s identification number (VIN). The VIN will allow Automon to know what car it is plugged into and if it is a new car. This will allow me to create a profile for each car, and if necessary keep statistics of it. Of course this requirement may never be implemented with the tight time constraints associated with the project but it is an essential part of the Automon kernel nevertheless. I also successfully implemented the sensor monitoring architecture. I can now create a “RealTimeSensor” by inheriting this class and overriding the convertResult formula as every sensor handles the hex response in its own way. These real time sensors can easily be added to the monitoring system. 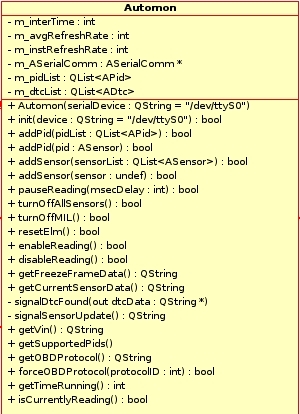 eg: automonObj.addActiveSensor(CoolantTempSensor). I can also set the sensor’s frequency. This sensor for example should not be updated every cycle as it doesn’t change that quick. RPM on the other hand needs much higher priority. This system is also proven to work. I can also pause monitoring by going to sleep, I can stop it by terminating the thread. These functions will be very important further down the line. I’m quite happy with the way my kernel’s archiecture is going now. Below is a code snippet of sending the VIN command and parsing a response. Of course this is still just quick code, all will be cleaned up before final release. So it was time to cross compile the Automon project to my ARM board. It starts fine but after a while, it appears that the serial reading misses an important delimiter character ‘>’. This results in a loop to infinity searching for this character. This is obviously a very serious problem. This is my theory: Debian Etch is currently running off an SD card. At times, writes have to occur to the SD card but these writes hang the whole system. The terminal connection to it, don’t even respond at these times. So I’m guessing this happens and some how the > gets discarded or losed in the serial I/O buffer. I would have thought that the buffer would still accept characters at a hardware level but it appears not. The ELM327 sends the ‘>’ character but when a SD write occurs, this character gets refused and is dropped. Eventually my system will be running of NAND on-board flash and I don’t think this will be a problem at all, but a temporary solution will be to implement a timeout feature when searching for the > character. This may require another thread however. I’ll look into this later on. The Automon kernel will be responsible for all the lower level ELM327 serial communication. 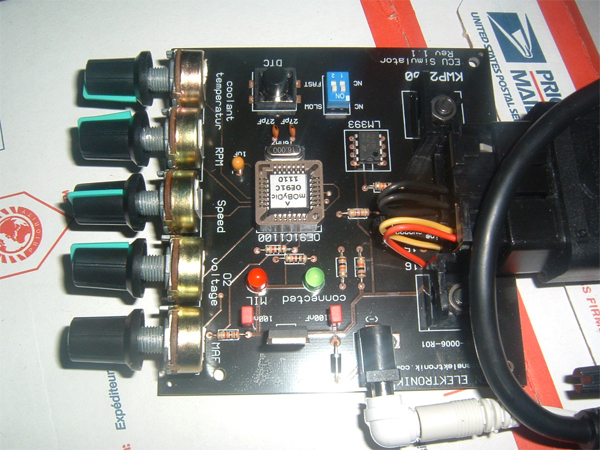 It will provide a easy to use interface to communicate with any ECU encapsulating all ELM327 commands. One of the design issues problems I am encountering is that not all responses from the ELM327 are “simple”. Most sensor commands result in a few bytes represented in hexadecimal and you apply a formula to get the actual human result in volts, rpm, degrees etc. Some results however are bit encoded. For example a request to Mode 3 of “03″ without a Pid results in a stream of bytes, with the first byte meaning how many DTCs are present and the remaining types of DTCs, where each is encoded to a special type, P, U, B codes etc and which are pending or not is also encoded into the bytes. I wanted to create a generic PID base class but the complications is causing problems. I want to allow the user to provide proprietary codes as well. To do this I would read the codes from a file but how do I specify the formula and the logic in the formula if it exists? – For example, some formula’s have, If Byte B == 0xFF (all 1s), then it means this, other wise take byte A and do something else. One solution would be to using scripting. 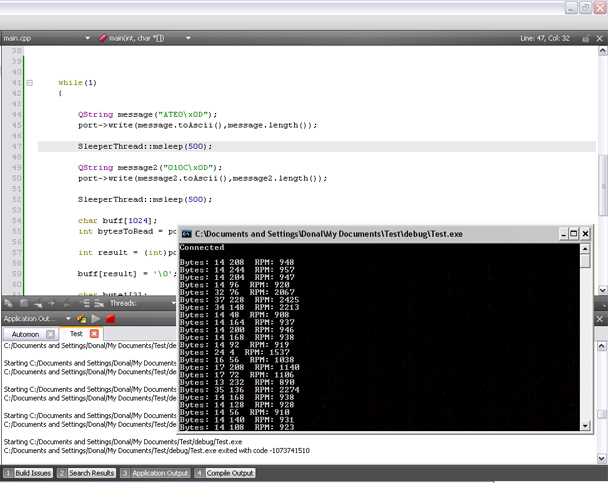 QT provides a useful scripting engine in the QScript module. I might look into this and get a better understanding of it. Alternatively, if I want to make my system less flexible, I could create a Sensor class and derieve each sensor over writing a “convert formula” method so each class of sensor has its own defined formula. Since the data structure holding these is so vague and none standard across all sensors, I thought XML would be a great way of representing this data for parsing later. The code took me about and hour or two, but I did have the QT serial stuff already done so that would have taken quite a bit more. This is only a prototype and cannot be used in any way in the final product. I am only doing proof of concept that I can in fact read from serial while updating a GUI. I noticed that if I reduced the refresh rate to 1/4 of a second, things got funny, it was missing bytes etc so the revs were all over the place. It seem to be perfect at about 300ms but that means refresh rate is only ~3Hz. This is actually quite noticeable when you rev up high quickly in neutral but on the road I’m guessing as you rev gradually in normal driving circumstances that it won’t look so bad. 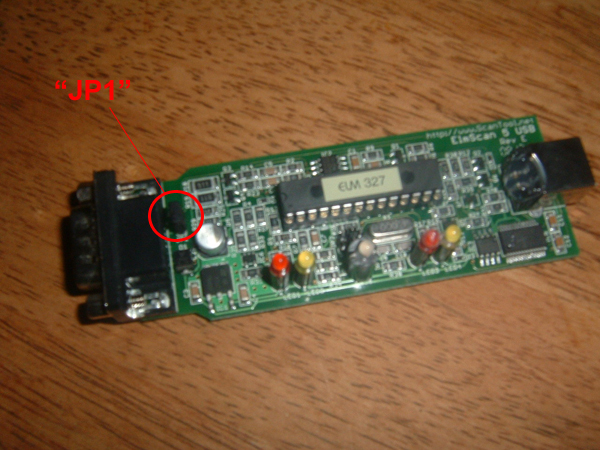 However, the product is not a problem with my program to the ELM327, the serial part is fine. It is a limitation of the OBD side and my car is using KWP2000/ISO 14230 so I will have to figure out more timing details on this protocol. Other protocols such as CAN should be OK speed wise but I will have to investigate more into that. 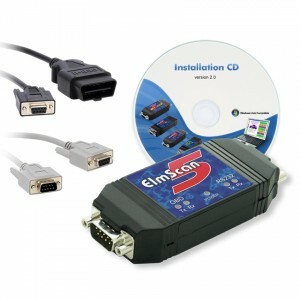 Today I decided to look for a proper OBD II/EOBD simulator. This would save so much hassle as I wouldn’t have to be going out to the car every second checking if a change made works. Further more, currently my SBC is plugged into a mains so it awkward getting it powered up in the car. 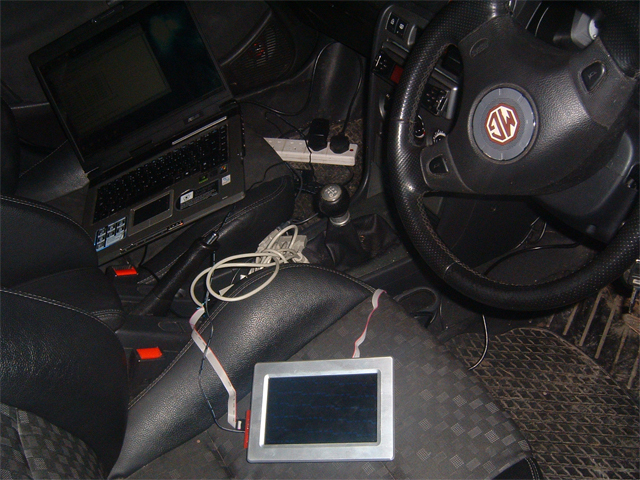 I decided to go with the KWP2000 protocol simulator as this is the same one in my car. I guess I really should pick another one and get tested on both types but I can simply just plug into another car later on anyways. This project is costing me a fortune! – Hopefully everything will pay off in the end now. 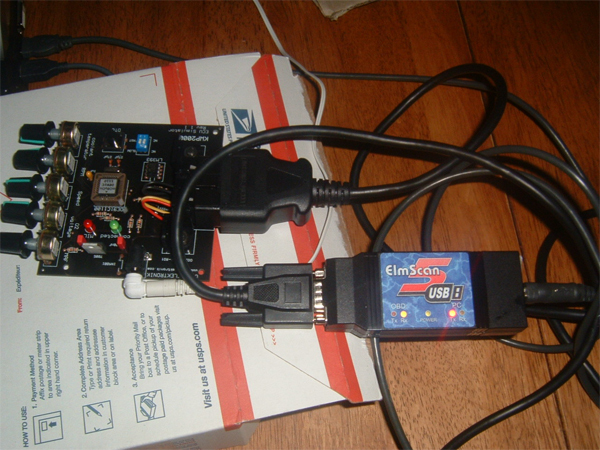 Today I received a genuine ELM327 Tool (ElmScan 5 ) from Scantool.net. These guys kindly offered me a free one worth 130 dollars since I was doing it for my final year project. Unfortunetely they sent me the USB version and I wanted the RS232 serial version so I may send this back. Technically though it should work away by using /dev/ttyUSB0 since the kernel is 2.6 and supports the FT232RL chip that is in the USB version that gives a virtual USB com port. Anyways I think I’ll be better off going with all serial at this stage just incase it causes problems down the line so might send it back to them. Thanks Vitaliy! Scantools are located here: http://www.scantool.net/scan-tools/. It is important to buy the ELM327 Scantools from here as ones on ebay and other places are generally fake replicas and do not work fully. Poor quality etc. I know myself since I bought one for 50 euro and it gives up randomly. 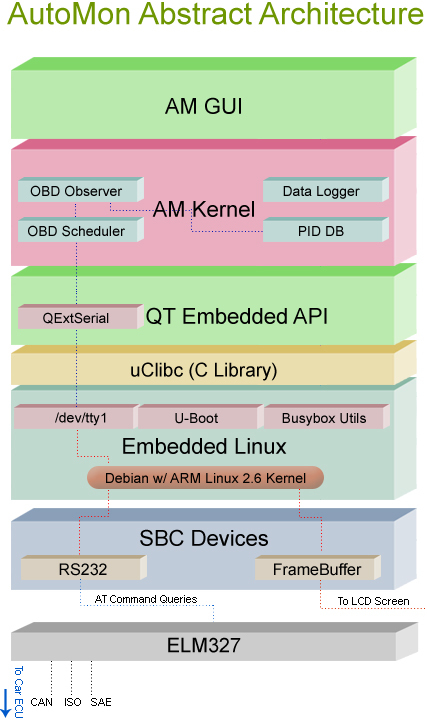 First of all I had to cross compile QExtSerialPort for ARM Linux. To do this I downloaded the tarball, unzipped it to my home directory. I set my PATH variable to point to qmake in QTEmbedded-4.4.3-arm. Then I ran qmake and make and it successfully compiled for ARM. In the build folder there is a libqextserialport.so.1.0.0 and libqextserialport.so.1 and few more. I copied all up to /usr/local/lib on my Device. Next I ftp’d my project from windows to vmware, the one I discussed previously. I had to modify the .pro project to the new location of qextserialport libraries (in my home directory) and I had to add an extra line: libs += /home/donal/qextserialport/build -lqextserialport. I also had to modify the main.c file to point to /dev/ttyAM1 which is COM1 on the board. Then I navigated to my test folder and done a qmake followed by make and resulted in a automon binary. Doing file automon , I confirmed that it was an ARM binary. I ftp’d this up to my device. And out comes the revs in the car perfect. It only does a snapshot every 1/2 second but it is enough for me now. Now I have done all my proof of concepts. Just to build the project now in QT! 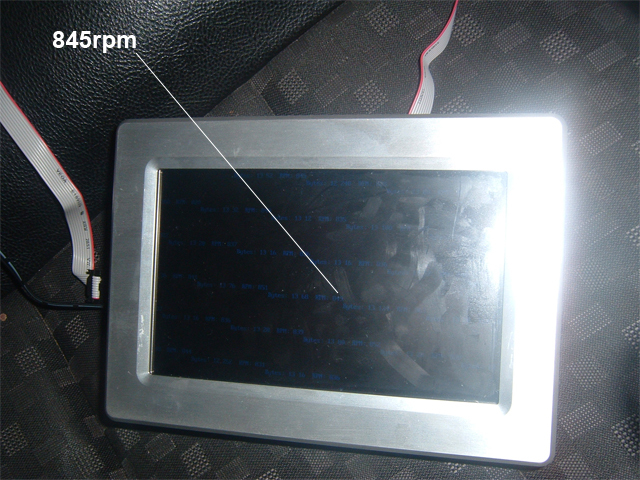 Today I decided to write a simple console application that would read the RPM of my vehicle in real time. Obtaining the RPM of the engine requires sending a Mode 1 PID of 0C to the ELM327. By default the ELM327 echos back the command to you along with the result to confirm that the command you sent was received correctly by the IC. To turn off this echo, you must first send a ATE0 command to the IC. Any internal configurations that is done to the IC is done via AT commands so once the ELM327 receives an ‘A’ followed by a ‘T’, it will interpret the following as internal configuration and not send the command to the ECU on its bus. Next after doing that I continuously sent the command “010C” to get a result (in hex) from the ECU. The ELM327 won’t execute the command you sent until it reaches a carriage return bytes ‘x0D’ so this is appended to the string I send. The response will always be: 1st byte the mode + 40, so we should get our first byte as “41″ and the next will be the PID of “0C”, the following bytes are the ones we want to interpret. The ELM327 separates each bytes with a character space for readability but this can be turned off using “ATS0″ but I will parse by these spaces. My program worked successfully, however the timing was an issue. I done a continuous while loop with a sleep of 500ms in between using QThread but anything less, the response came out of line and I got a result of 0 rpm. By right using the sleep is not the correct implementation. I should be using QTimer and creating a slot that gets called periodically on a timer signal. I will work on timing later but I am happy just to get a real time output even if there is a second delay between each output. Newer versions of the ELM327 supports an adaptive timing feature that I will exploit later on to get more samples per second thus making it more real time. I used the strtol function to convert the hex bytes to decimal equivalents which is quite useful. Below is the output of my car as I varied the throttle. Having to be in close proximity of your car all the time, within a metre of the ECU is not very practical for me so I’ve two options: Find a Software Emulator that will emulate the ELM327 interface or else set up a physical ECU standalone out side of the car. The idea of setting up a standalone ECU was interesting and doing some research into the MEMs ECU system of my MG I figured out the input and output pins of the ECU. Looking on Ebay I didn’t see many offers for ECU’s that are modern enough to support OBDII protocol so done a little searching for emulators. I came across this site: http://www.geocities.com/darkyp/eng/ecuemulator.html. 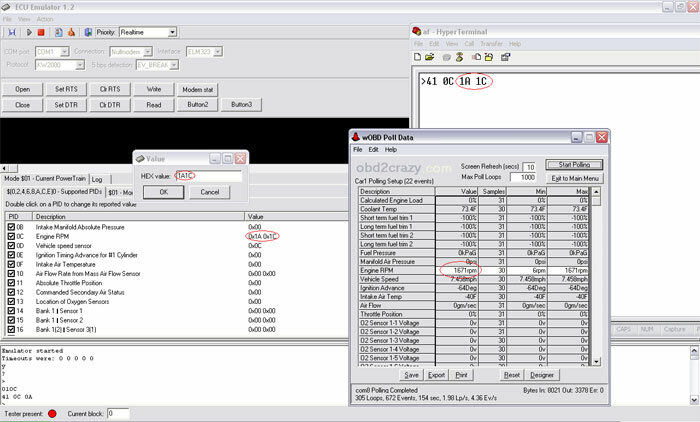 ECU Emulator (ECUEmu) is a handy piece of software that simulates or more emulates the actions of the ELM327 chip and the Jeff interface. I came across Jeff’s interface previously but opted out for the ELM327 as it supported much more. 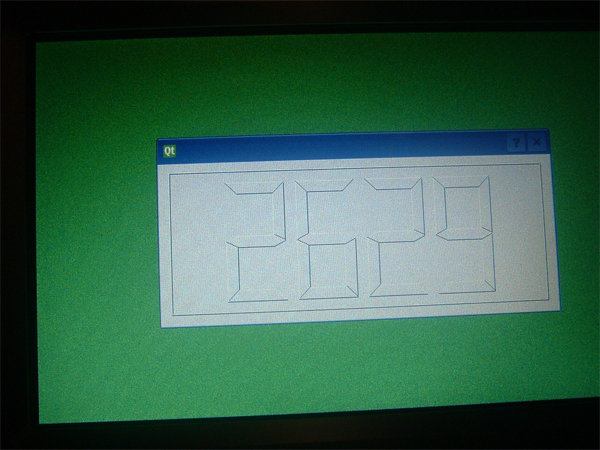 The ECU emulator requires that you have two computers, each with serial port. ECUEmu attaches to one and you can use hyperterminal at the other end to get the ELM327 > prompt. I attempted to create a virtual emulated port pair using com0com but unfortunately it didn’t seem to work with ECUEmu. Fortunately though I have 2 usb->serial adaptors for the laptop and a null modem cable so I done a loop back between the two. Laptop->USB->Serial->nullmodem->Serial->USB->Laptop. I set up ECUEmu on one side and used the default settings for hyperterminal on the other (9600, 8N1). I got a prompt. Next to test it, I set the value of the engine RPM to 1A1Ch and done a look up using hyper terminal by typing in hex 010C (Mode 01 with PID code of 0C. Click here for more details). The returned value then was 2 bytes, 1A1C. The 1A1C is the value we set above and to convert this to a real value you use the conversion formula: ((A*256)+B)/4. Here A is the decimal equivalent of the first byte 1A h (26) and B is the decimal equivalent of the other byte 1C (28) so we get ((26*256) + 28/4) = 1671 so our value for RPM is 1671rpm at least it should be!. To confirm I opened up a OBD Program and connected it to the com port associated with the other end of the null modem cable. The results I obtained from it did indeed match so success! So there I have it, an obtained RPM value from the ECU Emulator. This should save a lot of trouble and not having to be next to a car all the time. However by the looks of the program it only supports OBD Mode 0, these values such as RPM, Speed etc. 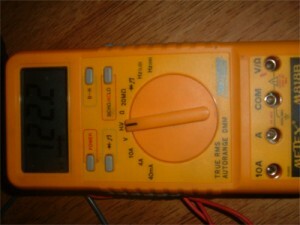 I’ve to figure out how to test Diagnostic Trouble Codes (DTCs) as well. This may require me to set up a proper ECU later on and simulate something like a miss fire, how I’ll do that I’ve no idea. I will be mainly dealing with the first few modes. 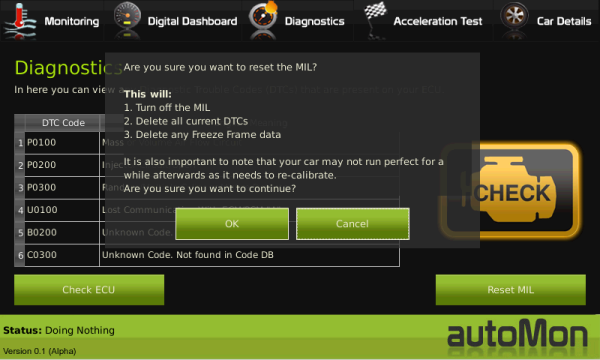 So I will still require the use of a ECU at some stage and some way of simulating changes of values. I believe by hooking up a 12volt power supply and doing the neccessary groundings that I should be able to get something up and running. However, without any sensors I will get readings of 0volts, 0rpm etc so I may have to develop a variable sensor, probably a variable resister, that will change the resistance on the circuit to simulate changes in coolant temperature for example. Some day however I’ll get around to that.